Talent agencies are frequently in a state of flux. Several clients are engaged in multiple projects, from film to TV to videos and more. Billing, payments, bookings, and other financial challenges are made even more complex by the sheer volume of work. Valuable time is spent in day-to-day tasks instead of gaining financial insights that are critical to success. Let the experts at RKL eSolutions put their talent to work for you and build an “A-list” solution that transforms your finance department and accelerates your growth and success. 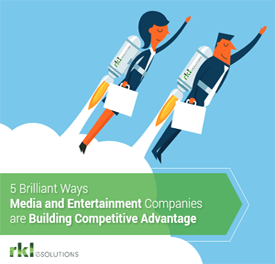 Keeping up in the entertainment and talent management industry is hard enough. When you don’t have dependable information on your true costs or your actual cash position, it’s mission impossible. Request a copy of our free eBook and find out how companies like yours are using the right tools to build competitive advantage. Leave your name below and we'll follow up shortly.